What happened to all those posts I promised in December? I had grand plans to edit photos, write patterns and have some posts queued up for January. Unfortunately, I brought back an unwanted souvenir from my trip to Costa Rica and spent the first three weeks of January fighting off a parasite. Daily life was hard enough, so I definitely didn't have the energy to create blog posts. The good news is that the parasite is gone! Now that I have the energy, I'll start tackling my queue of projects to share here. Starting with this baby blanket I made back in November. I found the Sugarplums Blanket on Ravelry (costs $5). 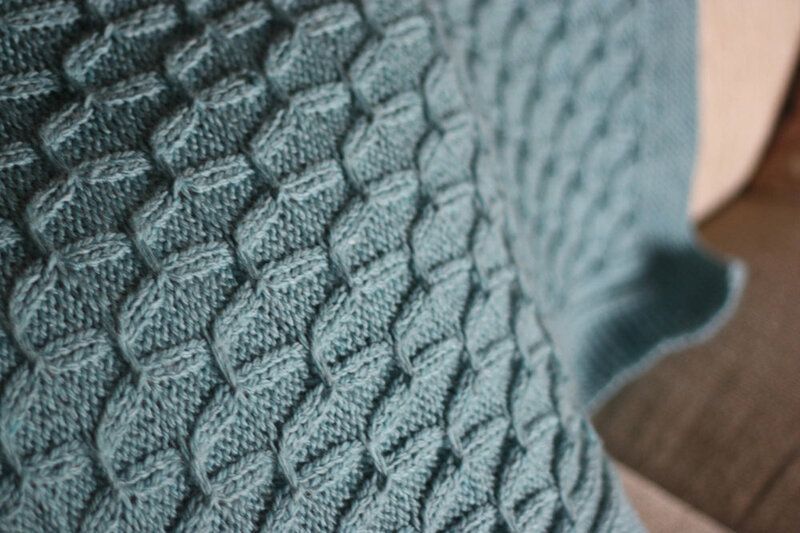 The pattern is easy to follow and includes a garter stitch border with a simple cable pattern. I like the unique cables and they really looked nice after blocking the blanket. The pattern calls for madelinetosh yarn. I love the colors and quality of madelinetosh yarn, but it's a little out of my budget, especially for larger projects like blankets. That being said, I really loved the Cascade 128 Superwash yarn I used. It's 100% merino wool making it warm and super soft. The color (summer sky heather) is a really lovely mix of green / blue and perfect for any gender (though I made it for a little boy). Once you get the hang of the pattern, it knits up pretty quickly and makes a great gift!